Resolution #1: Reduce. I am going to buy less — especially those things that have a negative impact on the environment, such as plastic tableware when I have company coming for dinner. I am also going to reduce my energy needs. I am going to wear more layers of clothing at home this winter, for example, so I can lower my thermostat without feeling cold. 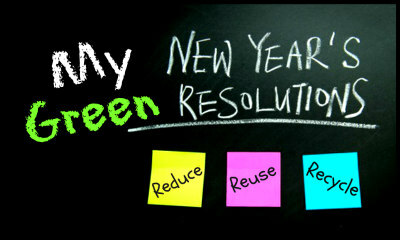 Resolution #2: Reuse. When we go out to eat, I am going to try to bring my own containers to take home the leftovers. Styrofoam can take hundreds of years to decompose and is one of the most frequent pollutants found in our oceans. Even more scary is that fish and birds often mistake Styrofoam for food and eating too much can be a death sentence. On the positive side, I already have purchased small reusable coffee pods for my coffee maker. According to an April 2016 article in The New York Times, the 9 billion single-serve non-reusable plastic coffee pods sold in 2015 “placed end to end would circle the globe roughly 10 times.” I love my coffee, but I don’t want to contribute to that pollution. Now may also be the time to gift my office with refillable pods and coffee to fill them. Resolution #3: Recycle. We have single-stream recycling where I live, which does make it easier as the paper, glass and plastic all go into the same containers. However, when glass and plastic are recycled, they should not have food residue and I admit sometimes I fall short in this respect (do you know how hard it is to get a peanut butter jar clean?). But I am going to try harder. For Omnivores: A recent position paper on vegetarian diets from the Academy of Nutrition and Dietetics states: “Plant-based diets are more environmentally sustainable than diets rich in animal products because they use fewer natural resources and are associated with much less environmental damage. Vegetarians and vegans are at reduced risk of certain health conditions, including ischemic heart disease, type 2 diabetes, hypertension, certain types of cancer, and obesity.” As a vegetarian, my bases are covered. But we all know that eating habits are hard to change, so start gradually — take one day a week to try vegetarian options. Lighting: As your bulbs burn out, replace them with energy-efficient bulbs. LED bulbs have come down in price, contain no mercury and only use one-sixteenth of the energy of conventional bulbs. Water: Our world is water-challenged. About seven hundred million people cannot afford and/or have no access to safe drinking water. In the United States, we are seeing more severe droughts, due to higher temperature changes. The higher cost of water is a factor as well. The Circle of Blue, a non-profit that monitors the world water supply, has indicated that the residential water rate in the United States has increased by 41% since 2010. Water rates are dependent on the cost of operation and management of pumps, pipes and treatment facilities. Those of us lucky enough to have clean drinking water should be thankful — it is necessary for life. And yet, we continue to waste water, with uncontrolled running water in sinks and showers, leaky faucets, and over-flushing, water-inefficient toilets. Running bathroom faucets use 2 gallons of water per minute. I try to turn the water off when I brush my teeth until it’s time to rinse. I also try to take shorter showers that feel just as good with my low-flow shower head. And I buy all-natural, biodegradable shampoo and soap, which is sold in most supermarkets today. The average toilet uses 1.6 gallons per flush and older toilets can use up to 3.5 gallons. You can replace your toilet with one that is more efficient, but a less expensive solution is to put a half-gallon sealed container full of water in your toilet tank — you’ll use 1/2 gallon less each time you flush. 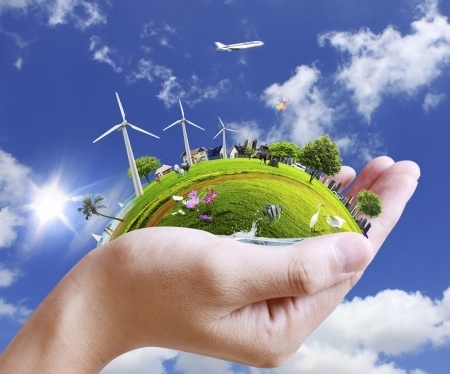 More information: A great place to get more ideas about what you can do to help the Earth in the New Year is the Jewish Energy Guide. There you can find articles about the sources and cost of energy; its impacts on climate change; and how we can change the inheritance we are leaving to the future inhabitants of our world.